A lot of people are interested in finding new ways to make extra cash online and they'll sign up for all kinds of opportunities without ever really taking advantage of the referral program. It's unfortunate because that's a great way to make these sites work for you, but some of my readers don't want to feel like they're spamming their friends to sign up under them for a survey site that tosses you a new survey about once every blue moon. I totally get it! So, here's a list of some of the best referral programs that your friends and family won't mind checking out. With Ibotta, you get cash back for buying certain items at stores you visit regularly. It's a great way to get some extra savings for purchases you might make anyway. I often see things like bread and milk on the app plus a variety of interesting snacks and items I might not normally buy but want to try. And there are a lot of ways to get cash back for no grocery purchases. You can usually find several restaurant offers on Ibotta as well as movie ticket purchases and so on. The best thing about Ibotta is the referral program. You get $5 for every referral that makes a verified purchase! Since the app is so handy anyway to get cash back for your normal purchases, you don't have to feel awkward about asking your friends and family to sign up under you. The drawback is that it's a one-and-done because once you get that $5, that's all you'll earn from them. However, Ibotta does have group goals and promotions going on so you can continue to earn bonuses so long as you and the people who signed up under you make certain types of purchases within a time period. Click here to sign up for Ibotta or read our Ibotta app review first. Swagbucks offers a ton of way to earn SB, which is what they call their currency. One hundred SB is equal to $1 and you can exchange your SB for a variety of gift cards. It's one of the oldest GPT (Get-Paid-To) sites on the web and a ton of people use it for extra cash because it's so easy to earn SB. The best thing about the Swagbucks referral program is the fact that you get 10% of the SB earnings that your referrals make for life. There's no cap on it at all. If you get enough people signed up with your referral link, you will enjoy a steady flow of SB from whatever they're doing on the site for as long as Swagbucks sticks around. Another great thing about the Swagbucks referral program is that they have frequent monthly promotions so you and your friends can earn a little extra. Click here to sign up for Swagbucks or read our review of Swagbucks first. If you enjoy paid surveys and really hate being disqualified for a survey without any compensation for your time, you definitely need to check out PaidViewpoint. I've been a member for years now and I always get paid for every single question I answer, even if I'm ultimately disqualified for the larger payout. I also enjoy nearly daily surveys for 10 cents that simply want to know more about my demographics. These are extraordinarily easy to do and their mobile site is very polished so you can check in on the go and keep on top of whatever they have available. The referral program from PaidViewpoint is a little more limited than Swagbucks because you can only earn $25 from each person that signs up under you, but I still like it because they get paid for everything they do. This means you do, too. You also get a little more from your referrals on PaidViewpoint, to the tune of 20% of their earnings. That's not bad! Click here to sign up for PaidViewpoint or read our Paid Viewpoint review first. Qmee is a browser extension that will populate a list of ads on the side of your screen when you visit and search at certain shopping websites. Navigating to these ads and browsing around a bit will earn you a set amount of money. You can also fill out surveys that are worth a fair bit more than the ads. It's super easy to use and pays out to PayPal nearly instantly with no cash-out minimum! You also have the option of cashing out your funds for an electronic gift card which is usually delivered instantly to your email. The Qmee referral program is pretty great and also kind of disappointing. You don't earn anything from the people who sign up under you except for a flat $1 whenever they cash out for the first time. However, since there's no minimum cash out and earning through Qmee is so easy, you can be pretty sure that you'll see that $1. Click here to sign up for Qmee or read our Qmee app review first. If you've already checked out Swagbucks and enjoy it, then I highly recommend InstaGC. It has many of the same earning opportunities as Swagbucks. These gift cards are electronic and delivered instantly! They also give you the option of getting your earnings through PayPal once you've redeemed enough gift cards. You can earn points from searching the web, filling out surveys, playing games, watching videos, completing offers and more. 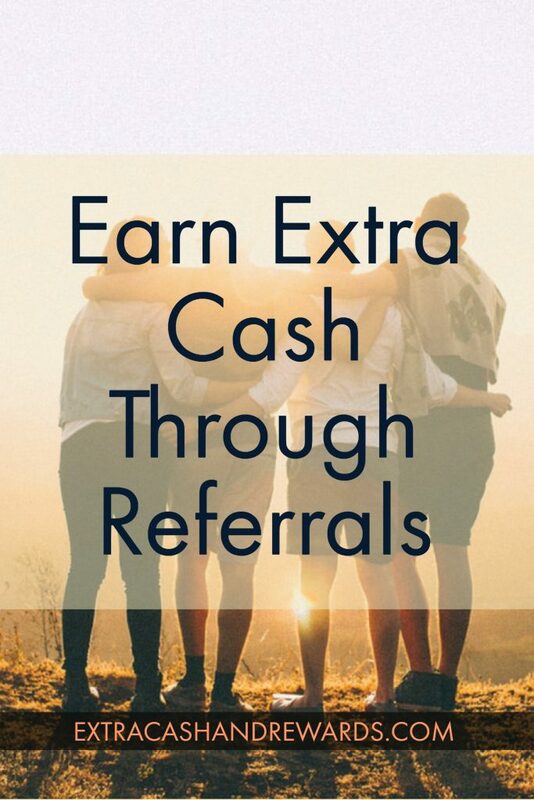 The InstaGC referral program is awesome because you gain 10% of your referral's earnings for life plus a flat 10 points for every person that signs up under you and confirms their email. It's a really easy site to use and earn on so you can enjoy a reasonable amount of points from the people who sign up under you, assuming they actually use the site. Click here to sign up for InstaGC if it interests you. It goes without saying, but getting referrals isn't exactly easy. It definitely helps if you have a web or social media presence. But many of you don't have that. As a person who isn't a blogger or major social media influencer, you can still refer your friends and family. And the best way to go about doing this is being honest. If you've earned money with a site or program, show them the proof. Tell them exactly what you did and how long it took to get your payment. Tell them what you like and also what you don't like about the site you're using. Don't worry — telling someone what you don't like won't necessarily turn them off from signing up. They'll appreciate your honesty and will make them feel that you are also being honest about the good things you're saying, too. There are some more referral tips here if you'd like more help getting people signed up. Feel free to drop your referral link in the comments and tell us what you like best about any of these sites! Know of a great referral program not listed here? Please share!